The San Pedro, a member of the 1733 Spanish treasure fleet caught by a hurricane in the Straits of Florida, sank in 18 feet of water one mile south of Indian Key. She is the oldest shipwreck on the Shipwreck Trail with the mystique of a Spanish treasure shipwreck to draw divers and snorkelers alike. The 287-ton Dutch-built vessel San Pedro and 21 other Spanish ships under the command of Rodrigo de Torres left Havana, Cuba, on Friday, July 13, 1733, bound for Spain. The San Pedro carried 16,000 pesos in Mexican silver and numerous crates of Chinese porcelain. Upon entering the Straits of Florida, an oncoming hurricane was signaled by an abrupt wind change. The Spanish treasure fleet, caught off the Florida Keys, was ordered back to Havana by their Captain. But it was too late, the storm intensified and scattered, sank or swamped most of the fleet. The wreck of the San Pedro was found in the 1960s in Hawk Channel. At this time, the site was heavily salvaged by treasure hunters. Silver coins dating between 1731 and 1733 were recovered from the pile of ballast and cannons that marked the place of her demise. Elements of the ship's rigging and hardware, as well as remnants of her cargo, were unearthed and removed. The large pile of ballast, dense stones from European river beds, typically stacked in lower holds of sailing ships to increase their stability, marks the spot where the San Pedro went down. Mixed in with the ballast are flat, red ladrillo bricks from the ship's galley. 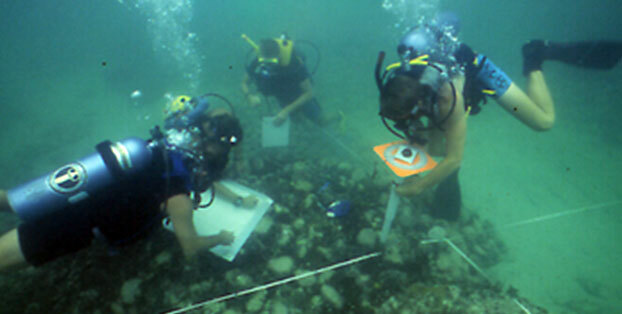 In 1989, this site became a State of Florida Underwater Archaeological Preserve. Replica cannons, an anchor from another 1733 shipwreck site, and a bronze plaque were placed on the site to enhance its interpretation. 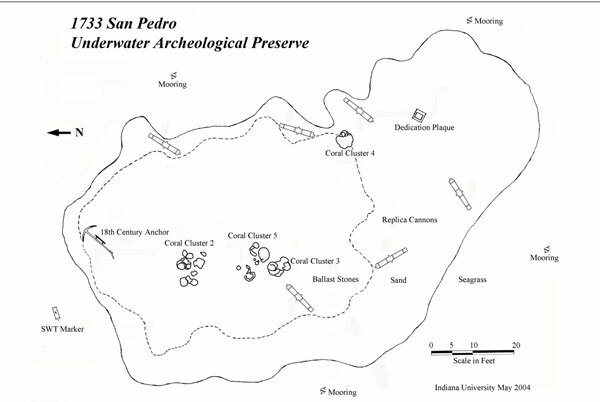 Click here for a printable version of the San Pedro site map. 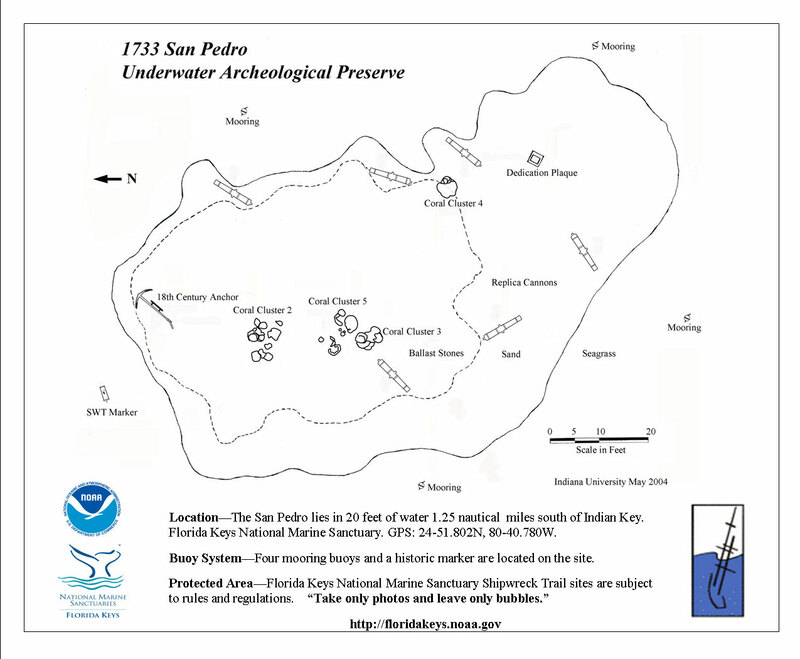 View a map showing the locations of buoys at the San Pedro shipwreck site.